It’s the 16th of February. Day one off of the plane, I look around and things are already different from what I know at home. The Kiwi accents, people driving on the left side of the road, warm weather in February..it’s a whole new world to me. I get dropped off at my flat and head upstairs to my room. No one had gotten there yet. One house down I can hear laughter and the sizzling sound of fresh meat on the grill. I start unpacking and get caught up thinking about my friends back home and get swept up in a whirlwind of fond memories. Eventually I break out of my early onset homesick daze and decide to head next door and check out what’s on the grill (As an avid food lover, I couldn’t resist). Next door I meet a few people from the States, two Norwegian guys, and two Kiwi hosts. I was unaware at the time but these people would soon become a part of my family (And in case you were wondering, they had sausages and chicken on the grill). We exchanged stories from our homes, found common interests with each other, and realized I had finally found a sense of comfort in my surroundings that I hadn’t felt since I left my home back in Tennessee. It’s April and I’ve found a steady groove, established my routine, and classes are going great. I’m learning about Maori culture and the environmental history of New Zealand and find that they are both very interesting subjects. My flatmates are good guys and we all get along extremely well. A sense of dissatisfaction suddenly overwhelms me. Everything in my environment is different and exciting, but I have the feeling that something is missing from my experience. I begin to question myself. Why did I come abroad in the first place? Have I really connected with the culture here, or am I simply filling my head with knowledge from teachers and books? I pondered these thoughts for a few days. On the third day I headed off for a walk through the Dunedin Botanic Garden with the hopes of finding an answer. As I am approaching the entrance to the garden, I hear what seems to be live music. I think nothing of it and continue on with my walk. On my way back home I pass the house where I had heard the music earlier. This time instead of passing by I said to myself “Why not?” and knocked on the front door. A tall, thin man with rugged facial hair and a pony tail answered the door. A strong Kiwi accent with a soft and welcoming tone said, “Can I help you?” At this moment I knew a new chapter in my understanding of NZ culture was about to begin. I inquired about the sounds I had perceived to be live music and sure enough I was correct. This man, Raoul, played guitar, his flatmate played bass, and their other flatmate played the drums! Being a drummer myself I had been eager to learn more about the Dunedin music scene and the opportunity to jam with some locals had been only a dream of mine until this day. He offered me to join him for a cup of homemade lemon and ginger tea which I gracefully accepted. Through Raoul I met his friends and friends of their friends. Over the next three months I was able to attend over twenty concerts at venues in the city or at local students’ houses. 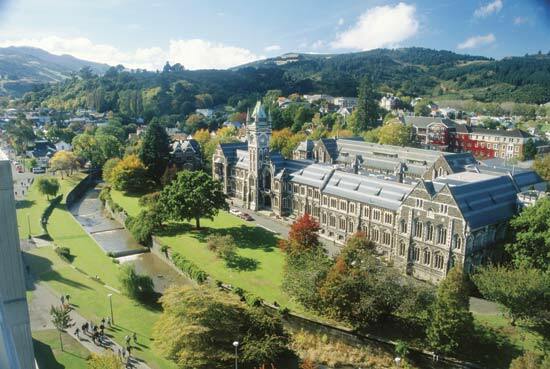 At the University of Otago they offered several extracurricular classes, one of those classes being salsa dancing. I was unsure about joining but decided to take the plunge. It was through this class that I met one of the most influential people of my study abroad journey, Charlotte, a Kiwi girl with a love for Spanish culture. She became best friends with my two flatmates and introduced us to many spots around Dunedin that are familiar to the locals. We began having tea (dinner) weekly at her Mum’s house. It was great to dine on some homemade Kiwi-style dishes and hear stories from her mother’s childhood in Dunedin. Charlotte took my flatmates and I on two backpacking trips while I was in NZ, one to Mount Cook and the other to Te Anau. My study abroad experience gave me the opportunity to take an introspective look at myself. Stepping outside of my comfort zone allowed me to make new friends. I was able to go beyond the lingo and stereotypes I had heard about these fascinating people and truly experience the richness of both the Kiwi and Maori cultures. This experience has transcended itself to make me more open now that I am back home. For example, I am more willing to start a conversation with a stranger. I am able to go beyond superficialities and see each person as having something unique to share. I see myself as the turtle that has emerged from his shell being able to explore a whole new world filled with amazing people and positive opportunities. Anthony Zamora is a student at the University of Tennessee at Knoxville and studied abroad with IFSA at the University of Otago in 2012.